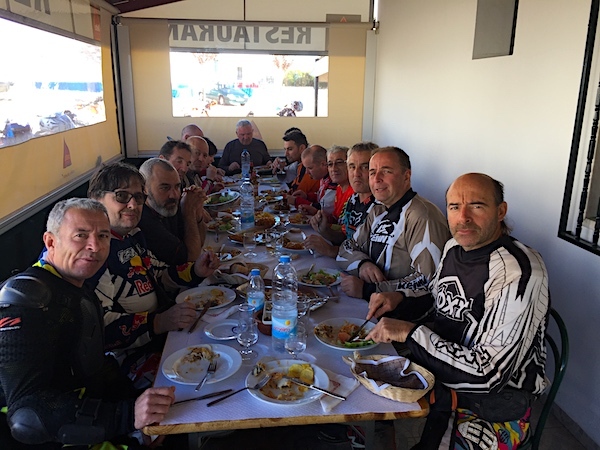 Since 2006 we organize motorcycle and mountain bike tours in Spain, Portugal, Greece and France. EXPLORE THE AUTHENTIC and WILD SOUTH OF PORTUGAL! The beautiful trails of southern Portugal will make you discover the extreme south of the Iberian Peninsula. Between plains and hills, hard and sandy, the variety landscapes will enchant you. Always very welcome in the hotels and the charming guest houses of our selection, you will taste the excellent local gastronomy. Suitable for trail bikes designed for road riding and off-road tires. Rental motorcycle: HONDA CRF 250 L.
DAY 1. Arrival in Lisbon. We will welcome you at Lisbon airport and we will make the group transfer from the airport to our base located 20 minutes from the airport. Briefing. Dinner and overnight in the hotel*** with swimming pool. DAY 2. Lisbon - Monsaraz (230 km) After control of the motorcycles, our first stage crosses Portugal from west to east. This long stage is largely on rolling tracks in the plains and in the cork oak forests. We will have a lunch break towards Evora. We will ride the afternoon on more winding tracks in the Serra d'Ossa which will offer us superb panoramas. We will finish the first stage in a very nice **** hotel with swimming pool close to the medieval city of Monsaraz. DAY 3. Monsaraz - Alcoutim (240 km) The second day we will run along the Spanish-Portuguese border. We will drive between olive and eucalyptus trees, in the Andalusian sierras almost desert of the east of the country. We will cross the beautiful Natural Park of Guadiana which offer very pleasant and tortuous technical roads. Lunch break in Mertola. We will enter the Algarve in the afternoon. Nice hotel *** with swimming pool for the evening and the night. DAY 4. Alcoutim - Alte (220 km) We leave Acoutim by beautiful tracks before reaching the banks of Rio Guadania through the village of Azinhal, along the Odeleite dam. We will then arrive in the mountainous Algarve. Lunch at Barranco Do Vehlo. In the afternoon we will ride exclusively in this paradise of off-road. We will spend the evening and the night in hotel *** with swimming pool in Alte. DAY 5. 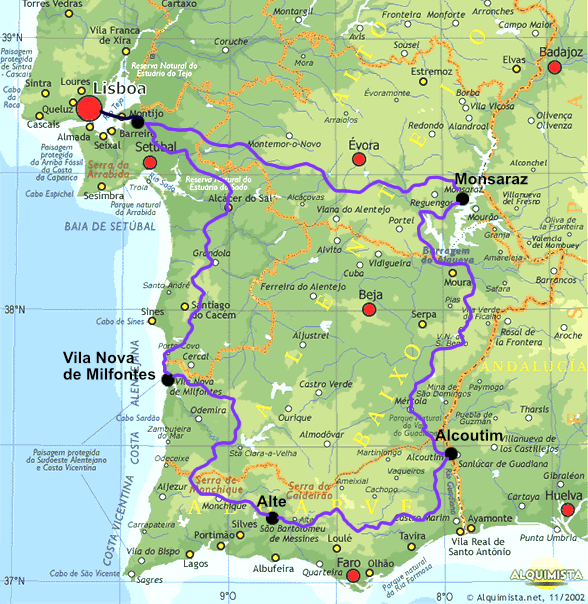 Alte - Vila Nova de Milfontes (220 km) A 90% Algarve stage with a lot of trails. We will have lunch in Santana. After we will go to the beautiful dam of Santa Clara before going back on mountain tracks. We will end this splendid day at the edge of the Atlantic Ocean in Vila Nova de Milfontes. Hotel *** with heated pool. DAY 6. Vila Nova de Milfontes - Lisbonne (210 km) Our last stage will begin with the ascent along the Atlantic coast on sandy slopes of the Alentejana coast and beautiful views at the top of the cliffs. We will leave the seaside to cross a small serra above Santiago de Cacèm with more winding paths. Lunch at Alcacer do Sal. We will close this beautiful tracks in pine forests to our base near Lisbon. Free evening, night at the hotel ***. DAY 7. Group transfer. After breakfast we organize your transfer to Lisbon airport in the early morning. Bonjour William, Merci pour cette très belle rando, bonne ballade et à l'année prochaine (on sera plus nombreux, ça c'est certain...) On a déjà envie de repartir ! Encore merci pour tout et à bientôt. Je tenais à te remercier pour ce super trip dans mon merveilleux pays. J'espère qu'on pourra remettre ça très rapidement. La prochaine fois on se donnera rendez-vous dans le centre-nord avec cette même bonne humeur !